We (my husband and I) raise Nubian Dairy goats, Boer and Kiko meat goats, chickens, ducks, rabbits, and currently one token Arabian horse on over 100 acres. We own 8 LGD’s, both Maremmas and Great Pyrenees. I love watching and learning about the different personalities of each dog individually and each breed as a whole. 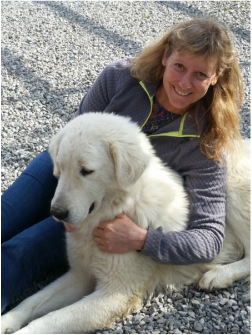 I am Becky Spencer and I am hoping to become a member of the Board of Directors for the Maremma Sheepdog club of America. My husband and I are rather new the Maremma dog world (3 years) and have found a breed that we can be excited about..
Education of the membership and the public is another goal of mine. Maremmas are wonderful guardian/farm dogs and the general farmer/rancher population need to know about them. I once asked this club to provide us with some flyers and/or education materials to take to a goat event and they were unable to provide any. These education materials should be accessible to all members in order to spread the word about our awesome dogs. I think members should also have access to a set of standard selling, breeding and stud service contracts, that are able to be customized; available through the web site on a member only page. Thank you for your consideration, I am happy to fill whatever position needed.